Ready to make good things happen for LGBTQ+ youth in Wisconsin K-12 schools? You can benefit our community by becoming a GSAFE Fundraising Champion and/or Broadcasting your love for GSAFE on The Big Share on March 7th. The Big Share is a single day of online giving on Tuesday, March 7th, hosted by Community Shares of Wisconsin to benefit its nonprofit members – groups that are on the forefront of the social and environmental justice movement in Wisconsin. Not feeling sure about doing fundraising but still feeling like a champ? You can also make good things happen by giving now to GSAFE to join us in building our vision where LGBTQ+ youth thrive – not just survive. The Big Share gives everyone a chance to build a community where all our students can thrive! Want to show your love for GSAFE and help funds to support our work? Broadcast your love for GSAFE – Help us reach a larger audience by taking to social media and email and telling your network why you support GSAFE, and why they should support GSAFE, too. We’re particularly want individuals and teams to use Facebook – especially Facebook Live – to share their love for GSAFE. Check out these resources for broadcasting your love. Become a Champion – Acting as a fundraising champion, you create a fundraising page and share it with your friend in two easy steps. Just click “fundraise” on our page to get started. Here are 10 tips on how to be a fundraising champion. Issue a Pledge Match Challenge – Whether you are a business or corporation, individual, family, teammates, or a group of friends, consider issuing a dollar-for-dollar Pledge Match Challenge during The Big Share on March 7th. People often give (and give more) when they know their donation will be doubled. Contact GSAFE to learn more! You, too, can make good things happen for LGBTQ+ youth in Wisconsin K-12 schools. 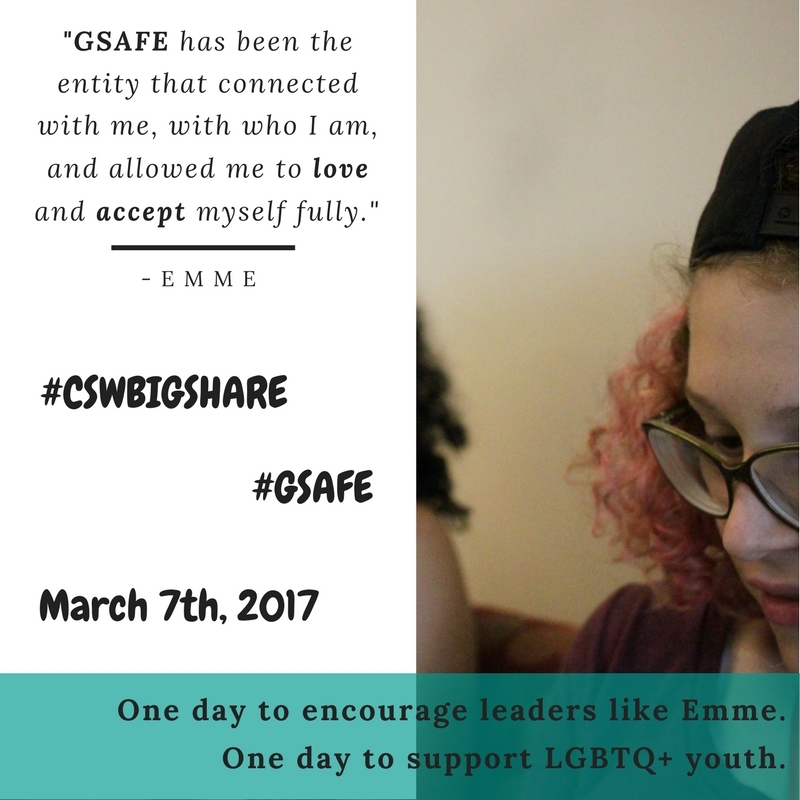 Give now to GSAFE & The Big Share and help us get off to a great start!